Here are a few more hints and tips for parents. If you are a new rider (or a frequent rider) these tips can help you maximize your experience. I have found them to be personally helpful and hope that you will too. Families with children can pass time by pointing out the surroundings. Make a game out of counting the buses. See if the kids can make a sentence by starting each word with the spelling of Megabus. Have them count how many signs they see or talk about what they'll see on the highway. Snacks and books may also be helpful. Bring activities that will keep kids entertained. Videos and MP3 players are great. Plan for a back-up just in case the electricity or WI-FI is out. This is another time when snacks and drinks for kids may help. I cannot stress this enough. I've seen parents who allowed their children to roam the bus aisles. Really, this can be a hazard to everyone. Plus, kids on the top floor may need help getting to the lower level bathroom. The Megabus is a moving vehicle and kids should never be allowed to distract the bus driver If you wouldn't allow a particular behavior in your family mini-van please don't allow it on Megabus. There may only be a window of 15 minutes or less for breaks. Watching the kids makes sure that everyone boards and allows for prompt departure. 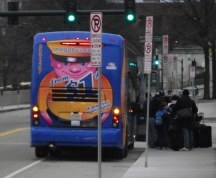 With these tips in mind, Megabus can be a viable road trip option for parents with kids.